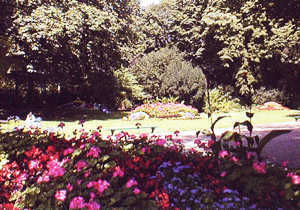 The ”Jardin Vauban” was created in 1863 by Barillet-Descamps, a landscape architect and chief gardener for the City of Paris. This romantic Second Empire garden is a relaxing place which offers charm and serenity. Winding paths and flower beds, testimony of the city's gardeners' expertise, run along the park's 35000m2. An artificial cave provides water for the ponds welcoming ducks and moorhens. The ”Chalet aux Chèvres” (the goats' shelter), built after the agronomist Charles Rameau's last wishes, has welcome a puppet theatre since 1989. The ”Jardin Vauban” also provides many outstanding XIXth century trees. In the west part of the park, there is an extension with the fruit tree cultivation garden where old regional varieties of pear and apple trees grow. They are cut in the traditional way: in palmette, espallier or simple/double cordon. Workshops were created in 1868 to teach fruit tree growing. The gardener still gives classes today.